To book a tour, please download, complete and return a Cycling Tour or Walking Tour booking form. For bike hire, please download, complete and return a Bike Hire Booking Form. Our hire centre and shop are open Monday to Saturday between 9.00am and 5.30pm, and (from March to October) on Sundays from 10am to 4.30pm. In practice you will often find us here much earlier/later than this! (And, if you book in advance, you're welcome to pick up/return bikes outside these hours by arrangement.) You can reach us by phone seven days a week between 8.00am and 9.00pm and by email anytime you like. Walking and cycling tours and bike hire are available all year. Drover Holidays is based in the town of Hay-on-Wye, which lies just inside Wales. View a location map of our bike hire centre. A regular bus service connects Hay-on-Wye with Brecon to the West, and Hereford to the East - for route information you can download a current bus timetable. This bus doesn't accept bikes, but during the summer months the Brecon Beacons National Park is served by the Beacons Bus and several of these services can accommodate cyclists and their bikes! Visit the National Park's website for route information and a Beacons Bus timetable. 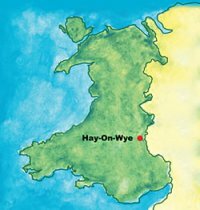 Sadly Hay-on-Wye is not served by trains, the closest stations being Hereford (22 miles/35 km to the east), Builth Wells (19 miles/ 30 km to the north-west) and Abergavenny (27 miles/43 km to the south). On guided and self-guided tours, pick-up from the railway station nearest to the tour departure point is included, and we also drop you off at the end of your trip so you can take the train home. To check train times, fares and for information on any train journey in the UK, visit National Rail Enquiries or call 08457 48 49 50 (+44 20 7278 5240 from overseas). For information about bringing your bicycle to Wales by train, please contact the train operator or download this information sheet. From Birmingham, take the A456 as far as Tenbury Wells, then the A4112. Stay on this road, which becomes the A44 as it passes through Leominster, and then reverts to the A4112. Shortly after passing through Kinnersley, follow the signposts for the A438. Take this road as far as Clyro, turning left onto the B4351 for the final couple of miles to Hay-on-Wye. For detailed directions from anywhere in the UK, click here. If you book your holiday with us, we will provide full directions in your confirmation letter. The nearest airport is Cardiff International (70 miles/110 km to the south). Airport transfers can be arranged through local taxi firm Ride & Hike, which provides a pick-up and drop-off service for walkers and cyclists, with space for up to 6 bicycles.